I know, I’ve heard it before. You’re just not motivated to work out at home. Do you know why? 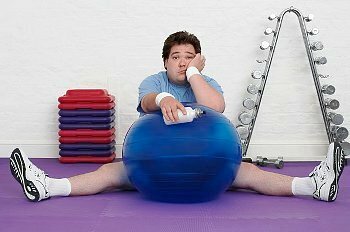 The reason is that you haven’t made exercise a habit. Do you floss, and brush your teeth after each meal? Take regular showers? Wash and comb your hair? I hope so. The reason you do them everyday is because you’ve made it a habit. A habit is a pattern of behavior acquired through frequent repetition. You don’t have to think about whether you should brush your teeth, because you know it’s good for you to take care of yourself. When it comes to exercise, that’s another story. Alot of you are probably thinking you lack the willpower. Not so. If you haven’t acquired an exercise habit, you’re going to have to train yourself a little bit every day, until you’re in the grove. You don’t need alot of room to get a good workout. You can get a great workout without joining a gym. A modest investment will save you hundreds of dollars in a gym membership. A downturn in the economy won’t affect your exercise routine. Workout whenever you want to. No worries about losing your favorite instructor. Your budget, fitness level, and preferences determine how you want to work out. Apartment dwellers have to consider whether their routine and/or equipment will disturb their neighbors. Jumping Jacks and cardio machines are very noisy. Determine what you think is F-U-N, otherwise you won’t stick to your routine. For some people using an Aerobics DVD is more enjoyable than doing 25 Jump Squats. Swimming in your own, or at a local pool. Keep it F-U-N to stay motivated. Start out slow, and build up gradually. Posted on July 28, 2012, in Exercise and tagged budget fitness, fun exercise, home workouts, outdoor cardio, strength training at home. Bookmark the permalink. Leave a comment.